1 of 1 Pat meat dry with paper towels. Using tip of a sharp knife, make small slits all over meat. Insert garlic into meat. Rub with oil; press pepper and rosemary onto surface. Cover with plastic wrap and refrigerate for 2 hours or up to 6. 1 of 2 Cut mushrooms into 1/2-inch-thick slices. Heat saute pan over medium-high heat; add bacon and cook about 3 minutes or until crispy. Add oil, mushrooms and rosemary; cook over medium heat about 10 minutes or until mushrooms are tender. Add garlic, cook 1 minute. Raise heat to high; add wine and 1-1/2 cups of the broth; cook about 5 minutes. Stir together remaining 1/2 cup broth and flour until smooth; stir into sauce and cook 1 minute to thicken. Let cool. Cover surface with plastic wrap and refrigerate until ready to serve. 2 of 2 To serve, heat oven to 375 degrees F. Remove beef from refrigerator and place in roasting pan. Roast at 375 degrees F for 35 to 40 minutes or until instant-read thermometer registers 135 degrees F. Remove roast to cutting board, tent with foil. Meanwhile, reheat sauce over medium-low heat until bubbly; swirl in butter just before serving. 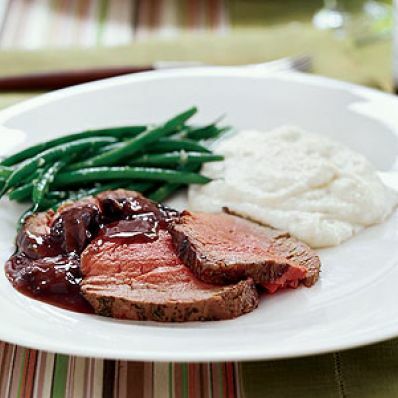 Slice roast and serve with sauce, creamy polenta and green beans.